This article was prepared from press materials distributed at the American Society for Radiation Oncology (ASTRO)'s 56th annual meeting, held September 2014 in San Francisco. The recommendation to not routinely recommend follow-up mammograms more than once per year for women who have had radiotherapy following breast-conserving surgery was one of five recommendations ASTRO released on its second list of procedures as part of the Choosing Wisely campaign. The list highlights five radiation oncology–specific treatments that are commonly ordered but may not always be appropriate. The evidence-based recommendations are designed to foster detailed conversations so that patients receive appropriate, high-quality radiation oncology care. Studies indicate that annual mammograms are the appropriate frequency for surveillance of breast cancer patients who have had breast-conserving surgery and radiation therapy with no clear advantage to shorter interval imaging. Patients should wait six to 12 months after the completion of radiation therapy to begin their annual mammogram surveillance. The recommendation noted that suspicious findings on physical examination or surveillance imaging might warrant a shorter interval between mammograms. The list below contains the other four ASTRO 2014 recommendations. 1. Don't recommend radiation following hysterectomy for endometrial cancer patients with low-risk disease. 2. Don't routinely offer radiation therapy for patients who have resected non-small cell lung cancer, negative margins, N0-1 disease. 3. Don't initiate non–curative radiation therapy without defining the goals of treatment with the patient and considering palliative care referral. 4. 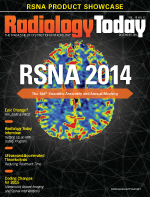 Don't routinely add adjuvant whole brain radiation therapy to stereotactic radiosurgery for limited brain metastases. Patients with inoperable, early-stage lung cancer who receive stereotactic body radiation therapy (SBRT) have a 40% five-year survival rate, according to research presented at ASTRO's 56th annual meeting. Such a positive survival rate is encouraging considering that historically conventional radiation therapy results in poor tumor control for patients with inoperable lung cancer. The study, an update of RTOG 0236 originally published in 2010, was also conducted by the original researchers to evaluate tumor control rates and side effects for patients at five years posttreatment. RTOG 0236 was a Phase II North American multicenter trial from May 2004 until October 2006 of patients aged 18 and older with biopsy-proven peripheral T1-T2 N0M0 non–small cell lung cancer (early stage with no lymph node involvement or metastases). Patients in the study all had medical conditions that precluded them from surgery, so they received SBRT, which delivers a high dose of radiation to the tumor in a decreased amount of treatment time, compared to standard radiation therapy, while minimizing exposure to surrounding healthy organs. SBRT appeared to improve tumor control in the initial study. Fifty-nine patients participated and 55 were evaluable (44 patients with T1 tumors and 11 patients with T2 tumors). Patients each received three fractions of 18 Gy (54 Gy total) of SBRT in treatments lasting 11/2 and two weeks. Researchers evaluated local control, disease-free survival, overall survival, and toxicity. Median follow-up was four years (7.2 years for surviving patients). At five years, the rates for disease-free and overall survival were 26% and 40%, respectively, with a median overall survival of four years. Only four patients had recurrences at the primary tumor site, resulting in an estimated five-year primary tumor failure rate of 7%, with a range between 1.8 and 4.8 years after SBRT. Nine additional patients had recurrence within the involved lobe, resulting in a five-year primary tumor and involved lobe (local) failure rate of 20%. The five-year local-regional failure rate was 38%, of which seven patients experienced a spread of the cancer to nearby lymph nodes or organs between 2.8 and 5.2 years after SBRT. Fifteen patients had disseminated recurrence throughout the lung, thus the five-year disseminated failure rate was 31%. Treatment-related grade three and grade four side effects were reported in 15 patients and in two patients, respectively. No grade five adverse events were reported. "Historically, when treating early lung cancer with radiotherapy, progression at the site of the primary tumor was the most common failure resulting in suffering and death," said lead study author Robert Timmerman, MD, a professor and vice chair of the department of radiation oncology at the University of Texas Southwestern Medical Center in Dallas. "The initial results of RTOG 0236 showed very good tumor control; however, many physicians were concerned that treatment-related toxicity would eventually appear, so SBRT has not seen widespread use. This long-term analysis confirms that treated tumors did not reappear at the original site; and late toxicity, beyond what was seen in the initial report, did not appear. However, metastatic tumors continued to appear over time in untreated sites likely because those tumors were so small at initial treatment that they were not detected. These five-year results demonstrate positive tumor control and disprove the misconception that short-course treatment will result in late-appearing, unacceptable toxicities." Source: "Long-Term Results of RTOG 0236: A Phase II Trial of Stereotactic Body Radiation Therapy (SBRT) in the Treatment of Patients With Medically Inoperable Stage I Non-Small Cell Lung Cancer"
The combination of chemotherapy and stereotactic ablative radiation (SABR) may be a promising treatment option for patients with locally advanced pancreatic cancer. The therapy may ultimately allow patients to undergo surgery that might not otherwise be an option, according to research presented at ASTRO's 56th annual meeting. Surgery is the only potentially curative therapy for individuals with pancreatic ductal adenocarcinoma (PDA), the most common type of pancreatic cancer. However, pancreatic cancer is often diagnosed at an advanced stage, making surgical removal of the tumor or the organ challenging, if not impossible. In addition, many patients with locally advanced pancreatic cancer may have microscopic spread of the disease to other parts of the body. There is no standard of care for treating patients with pancreatic cancer for whom surgery is not an option. Chemotherapy plays an important role in addressing microscopic disease. SABR, with its shorter treatment times and precision that lowers the risk of damage to normal cells, is a promising treatment modality for patients with locally advanced PDA. "This is a promising treatment option that may prove not only to be more effective than chemotherapy alone prior to surgery, it may also be better than chemotherapy and standard radiation," said lead study author Kimmen Quan, MD, a radiation oncologist at the University of Pittsburgh Medical Center. "Patients tolerated the chemotherapy and SABR regimen quite well, with excellent quality of life during treatment. These results appear to translate into better control of disease in the pancreatic region and a longer freedom from disease recurrence. This combination should be considered for patients with advanced pancreatic cancer, which is still a treatable disease, and could potentially improve survival in this patient population." This prospective, single-arm, phase II clinical trial was conducted to evaluate the safety, feasibility, and efficacy of induction chemotherapy followed by SABR in 34 patients who had biopsy-proven PDA. Eighteen patients had borderline resectable PDA, and 16 patients had locally advanced PDA that had spread into nearby blood vessels. The average patient age was 71, and 56% of the patients were women. Induction chemotherapy, consisting of gemcitabine and capecitabine, was administered over four 21-day cycles to 31 (91%) of the 34 patients. Three of the patients did not complete chemotherapy—one died after consent but prior to chemotherapy; one died during chemotherapy because of an arterial occlusion; and one had a myocardial infarction prior to completion of the four courses of chemotherapy. As evidenced by CT scan, the cancer did not grow or spread in all 31 patients who completed chemotherapy, thus all patients received three SABR treatments of 36 Gy each, including a 2-mm expansion around the gross tumor. Four weeks following SABR, radiation oncologists, surgical oncologists, and medical oncologists made a multidisciplinary decision as to whether each patient's tumor could then be surgically removed. Of the 31 patients, 12 (40%) proceeded to the surgery commonly known as the Whipple procedure, which removes the head of the pancreas, part of the small intestine, the gallbladder, the end of the common bile duct, and sometimes a portion of the stomach. Eleven patients (90%) who had surgery had no local disease after surgery. Ultimately, for this patient population, the findings translate to approximately 90% chance of local disease control at one year and greater than 20 months free of any disease recurrence. Source: "Interim Analysis of a Phase II Clinical Trial of Induction Gemcitabine/Capecitabine Followed by SABR in Borderline/Locally Advanced Pancreatic Adenocarcinoma"
A prospective study that compared patient-reported outcomes of a broad set of cancer patients with bone metastases demonstrates that single-fraction radiation therapy (SFRT) is equally as effective as multiple-fraction radiation therapy (MFRT) when pain, function, and quality of life are considered, according to research presented at ASTRO's 56th annual meeting. The multicenter study indicates that improvements in patients' pain, function, and degree of distress were similar between the SFRT and MFRT patients, including for the type of patients who were excluded from previous clinical trials, thus confirming the validity of prior randomized control trials to real-world practice. "Previous research has shown that SFRT is equally effective as more costly and inconvenient MFRT courses for patients with painful bone metastases, however, these studies have been generally limited to well-controlled clinical trials, where many patients are excluded, such as those with poor performance status, fractures, or neurological damage," said study author Robert A. Olson, MD, MSc, the research and clinical trials lead and a radiation oncologist. Six centers in British Columbia, Canada, participated in the study from May to December 2013. A total of 648 patients with bone metastases were evaluated (updated data), including 226 (35%) with metastases complicated by fracture or neurological compromise such as spinal cord compression. The mean patient age at diagnosis was 65, and 54% of the patients were male. Patients received SFRT or MFRT at the discretion of the treating oncologist, with 363 (56%) receiving SFRT and 285 (44%) receiving MFRT. The three most common primary bone metastases sites were genitourinary (31%), lung (22%), and breast (22%), with the spine being the most common site treated (44%). Patients completed both the pre- and postradiation therapy questionnaires. The three-question assessments were standardized and designed to measure patients' perception of pain, function, and quality of life using a nondichotomous, ordinal, five-point scale. Patients were asked to rate, on a zero to four-point scale (with zero being "not at all" and four being "very much") the degree of their bone pain, the degree to which the pain interfered with their ability to care for themselves, and their level of frustration with their bone pain. A multivariable regression analysis of the patient surveys pre- and posttreatment was performed. Comparisons were made between patients who received SFRT vs MFRT. Whether treated with SFRT or MFRT, patients in the broad clinical practice setting reported similar pain, function, and quality of life. There were no significant differences in changes in mean patient-reported outcome scores for SFRT patients vs MFRT patients—pain: 1.29 vs 1.17 point improvement, respectively (p = 0.24); function: 0.80 vs 0.95 point improvement, (p = 0.17); or degree of symptom distress: 1.26 vs 1.26 point improvement, (p = 0.98). Furthermore, the proportion of patients with a partial pain response was similar for patients who receive SFRT vs MFRT (73% vs 73%; p = 0.93) as well as the proportion with a complete pain response (19% vs 22%; p = 0.31). "There is a very low utilization of SFRT for bone metastases worldwide, partially because oncologists are often reluctant to use SFRT for patients who do not meet the criteria of previous clinical trials," Olsen said. "We wanted to determine if SFRT is equally effective as MFRT in the broad clinical practice setting, capturing all types of patients who receive radiation therapy for bone metastases. This study is ongoing, and to date, we have collected data from 648 patients who completed questions prior to and after radiation therapy. The results support the generalizability of prior randomized controlled trials to real-world practice, thus confirming that SFRT should be the standard management policy for patients with uncomplicated bone metastases. Further research is needed to confirm whether SFRT is also appropriate for complicated bone metastases, though our early results with a modest sample size suggest SFRT may be appropriate in some circumstances. We are hopeful that this will lead to increased use of SFRT for bone metastases throughout the world and improved quality of life for these patients." Source: "Patient Reported Outcomes on the Impact of Single Versus Multiple Fraction Palliative Radiotherapy for Uncomplicated Bone Metastases on Pain, Function and Degree of Symptom Distress"
Prostate cancer patients who received hypofractionated (HPFX) radiation therapy (RT) reported that their quality of life, as well as bladder and bowel function were at similar levels before and after treatment, according to research presented at ASTRO's 56th annual meeting. Additionally, results indicate that parallel quality-of-life outcomes occurred between groups of patients who received different regimens of HPFX RT. The phase I/II trial enrolled 343 patients with low-to-intermediate risk prostate cancer at five institutions from 2002 to 2010 to study the effectiveness of HPFX RT, as well as the patients' ability to tolerate the treatment. HPFX RT is RT in which the total dose of radiation is divided into large doses and administered over a shorter period of time (fewer days or weeks) than standard RT. All patients received intensity-modulated RT to the prostate and base of the seminal vesicles. Patients were divided into three groups based on dose-per-fraction schedules (the amount of radiation administered during each RT session). Researchers calculated and designed the three different HPFX regimens in hopes that each might achieve similar disease control and consistently minimal side effects for patients. Researchers evaluated the impact each treatment regimen had on the quality of life of patients, and all patients completed three quality-of-life questionnaires at baseline and annually for up to three years posttreatment. Patient assessments measured bladder, bowel, and sexual function, and included the Fox Chase Bowel/Bladder Toxicity questionnaire, the Spitzer Quality of Life Index questionnaire, and the International Index of Erectile Function questionnaire. Analysis of patient-scored quality-of-life bowel data at three years posttreatment revealed no significant difference in average pre- to posttreatment score changes. Additionally, there was little difference in composite quality-of-life outcomes across the three groups. "These results will significantly contribute to the continued understanding of hypofractionation in the setting of prostate cancer," said lead author Jeffrey V. Brower MD, PhD, a radiation oncology resident at the University of Wisconsin Hospital and Clinics. "We were pleased by the overall minimal changes from baseline noted in the study participants following hypofractionated radiation. The findings of nonstatistically significant differences noted when comparing hypofractionation regimens was as anticipated, as much work was done to calculate 'equivalent' doses and to predict late toxicities. Specifically, with regard to patient-reported quality-of-life outcomes, our research can assist in a continued paradigm shift concerning the role of hypofractionation in the treatment of prostate cancer, resulting in shorter treatment times and improved quality of life for our patients." Source: "Quality of Life Outcomes From a Phase I/II Multi-institutional, Dose-per-Fraction Escalation Trial for Prostate Cancer"